Access by sea involves sailing up Morlaix River Wide open onto the vast seascapes of the bay at its mouth, the estuary narrows as it meanders between lofty green banks, all the way to the locks that keep the port afloat. 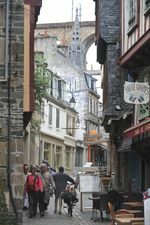 Fringed with trees and tall stone houses, its viaduct looming large, the port skirts round the magnificent 18th century buildings of Morlaix's former tobacco factory. The Port of Morlaix is easy to reach by TGV high speed train. With its bars, shops, cheerful boutiques, cinemas, theatre, museum, and huge Saturday morning market and more, Morlaix is a town you will truly enjoy staying in! It is also an excellent starting point for an exploration of the region. Protected from erratic weather conditions by its nestling position between two hills in the upper estuary, the Port of Morlaix offers mooring and berthing for more than 200 boats at the jetty and the quay, and all the facilities of a well-equipped modern port. The port welcomes all vessels up to 3 m draught. The Port of Morlaix locks are open from 1 1/2 hours before HW, during HW and for 1 hour after HW. As there are no signal lights on the river, the Morlaix port is not accessible by night. At the locks, a port officer will be waiting for you and will show you where to moor. You will be taken care of by experienced professionals, who can give you advice or assistance if necessary. Morlaix, though boasting immense architectural wealth, is no museum town. In this thriving cultural and commercial city, you can enjoy delicious patisserie sold in 16th century half-timbered houses, Italianate theatre evenings in a setting decked with red velvet and baroque paintings, and excellent shopping while wandering through the cobbled streets and alleyways. Morlaix is also the starting point for a number of tourist excursions, due to its proximity to the Morlaix-Brest express highway and its TGV railway station. Founded in the 10th century, at a Roman crossroads fording rivers as they open out onto the coast, Morlaix came into its maritime heyday in the 13th century. Well sheltered in the upper estuary, the Port of Morlaix became a busy centre of commerce. The local produce of the Léonard and Trégor regions (north-eastern Brittany) - linen, paper from the mills, wheat, butter, bacon, leather, horses, fish, cider, etc - rubbed shoulders with citrus fruits, spices, wines, salts and other exotic marvels. A number of merchants and pirates amassed huge fortunes. In 1522, following a spectacular raid by Englishmen covetous of such wealth, the inhabitants of Morlaix decided to build the Château du Taureau in order to protect their town. Trade in linen dropped off after 1680; privateering, conducted by pirates, again became rife! The confluence of the two rivers that run into the port was paved in 1728, and a huge vaulted square was built. The development of the port continued into the 18th century with the creation of the Tobacco Factory as a means of boosting once more the economic prosperity of the town. Quays were built to reinforce the natural banks and create mooring for vessels brought down the towpaths. In 1856, the construction of locks facilitated loading and unloading, as the boats were able to remain afloat. In 1862, the viaduct was built along the water's edge. At the end of the 19th century, part of the dock was covered over, and Place Cornic took shape. More work in 1962 saw the emergence of Place Charles de Gaulle. When opened to pleasure boats in 1978, the Port of Morlaix once again showed its ability to bring new activity to the heart of the town.